The owner of this Italian Greyhound holds gently onto one of the dogs ears, presumably to steady it for the exposure time of the photograph. The Italian greyhound is an ancient breed, believed to be at least 2000 years old. There are many authorities on the breed's history believe the breed was dwarfed for pet purposes from a Gazehound (hounds who hunted by "sight") of the distant past. The Italian Greyhound was very popular with royalty, some notable Italian Greyhound owners were Mary Queen of Scots, Charles I, Queen Anne and Queen Victoria. The exact date that the breed was introduced in England is not known, but by the Late-Victorian period the popularity of the breed reached a peak. 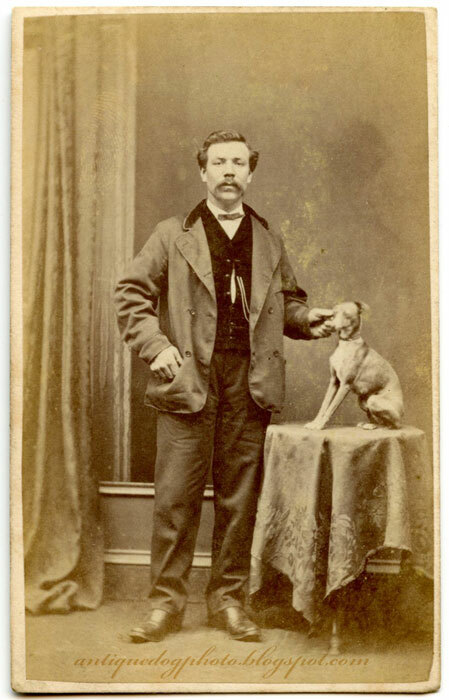 In 1872 Reverend Pearce wrote in his book "The Dog", "This toy dog, the most elegant, but alas! The most delicate of the small breeds, has existed from time immemorial and has always been in fashion. There is no doubt that it is simply a small specimen of the larger dog, refined and dwarfed by inbreeding and selection, and first introduced from Italy and the South of France, where they are more abundant, but not light, graceful or refined as those which are occasionally exhibited in England." The photographer who took this image was James Wood. He was resident as a photographer at 25 Market Street, Aberdeen from 1862 to 1868, so we can date this photograph within these dates.